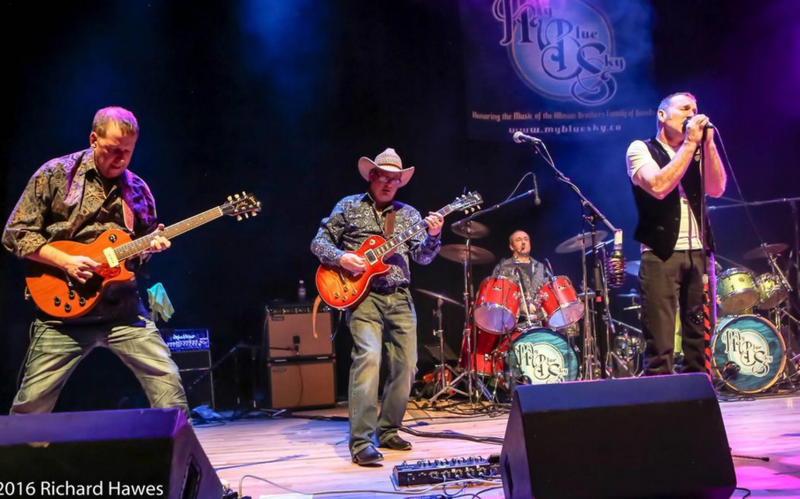 My Blue Sky “Honoring the music of the Allman Brothers family of bands.” Award winning My Blue Sky is comprised of 7 experienced Colorado musicians that all share the passion and love of the music of the Allman Brothers Band. The Allman Brothers Band have a unique blend of southern rock, blues, and jazz that have inspired musicians and fans for decades. Their music and performances have created memories for everyone that have stood the test of time. It is in that spirit that My Blue Sky honors their music. And they honor it well…My Blue Sky has placed First two years in a row (2014 and 2015) at Leftapalooza the Mile High Tribute Band Competition, and they have earned the support and approval of Gregg Allman himself. Westword recently honored My Blue Sky in their list of Top Ten Tribute Bands in Colorado. In November, 2016 My Blue Sky released their self-titled EP of original music further strengthening their ever-expanding catalog of music to share with audiences. Songs from the EP are getting airplay on stations such as 105.5 The Colorado Sound, Radio 94.9, KFFR in Winter Park, and KRFC in Fort Collins. “My Blue Sky was included The Colorado Playlist’s “BEST of 2017”!